Violetta is a hand drawn typeface created by Sam Parrett which is available in 5 styles, a wide range of OpenType features and language support. It pay attention to details. 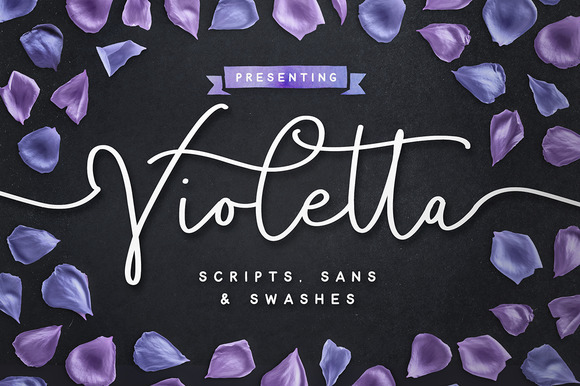 Violetta Script is a cursive font which has upper & lowercase characters and Violetta Script Alt comes with a completely new set of lowercase. Violetta Swash contains 24 useful swashed and Violetta Script Extended is the extended version of Violetta Script. The last style, Violetta Sans is a simple sans font perfect for the cursive script. It is ideal for any kind of project. Enjoy Violetta! A font description published on Wednesday, November 9th, 2016 in Fonts, Sam Parrett by Alexandra that has 2,526 views.